At Landscaping By J. Michael, we take pride in the work we provide our customers, both residential and commercial. Our clients have the option of choosing a maintenance and lawn care program tailored to their needs. Landscaping by J. Michael offers complete, prompt, and affordable maintenance and repair services. Through our highly trained and skilled in-house staff and extensive contractor contacts, we provide professional maintenance services of unmatched quality. From the initial bid to the final inspection, the Landscaping by J. Michael maintenance team will be available to insure all repairs are completed in a timely, efficient, and cost conscience manner. Listed below is a brief summary of property maintenance services for your rental properties, homeowner associations, and the general public. • Landscaping by J. Michael’s professional turnkey staff can clean, mow, plant – or do whatever is needed to get the outside of your new home move-in ready. When moving day comes, all you will need to do is unload the truck and unpack the boxes. • Selling your home? You get one chance at a first impression. 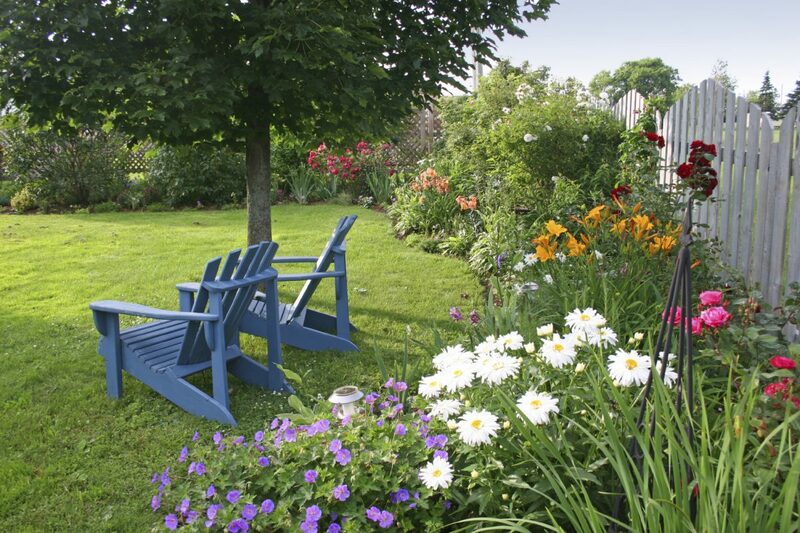 To make sure that first impression is a positive one, let Landscaping By J. Michael service your property. Whether your yard needs sprucing up, the lawn needs maintenance, or a deck needs to be pressure-washed, J. Michael will help to ensure that every showing is a success. • Aeration is essential in keeping your grass green and lively! • The process involves penetrating the surface of the lawn, which allows water, air, and nutrients to reach the roots of the grass. • It’s a great idea to schedule aeration during the spring and early fall. • J. Michael recommends scheduling aeration before closing the sprinkler system, as to avoid causing damage to sprinkler heads. • Proper pruning increases plant vigor and helps you manipulate its shape. • Well-pruned bushes maintain a natural shape and, to the untrained eye, will appear as if they haven’t been pruned at all. • Pruning lets the sunshine in, which invigorates bushes by stimulating the growth of buds, leaves and branches. This increases the aesthetic beauty of your landscape because the bush produces more foliage and flowers. • Increasing the number of leaves also enhances its photosynthetic capacity, which helps the bush feed itself. • Pruning rejuvenates declining, overgrown and neglected shrubs. For this type of pruning, we will cut back the entire bush to the ground, or cut the branches back to the main trunk, depending on the kind of bush you have. People who choose J. Michael to care for their lawn are interested in presenting a lush, well-groomed, beautiful lawn throughout the season. After all, who doesn’t love a bit of lawn envy? Our team will create and apply the best formula, according to your environment. Every lawn has various factors affecting its health and behavior, which is why every client is recommended a package specific to their needs. We use only the best quality and safest products available to incorporate into our 7-step program designed to maximize the effect of necessary treatments to maintain a thick, green, healthy lawn for years to come.